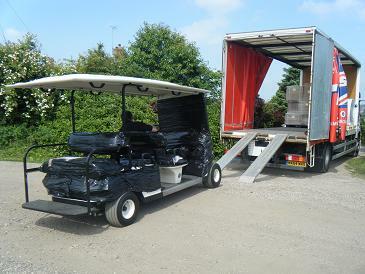 We personally deliver all our golf buggies to England, Scotland and Wales. We can deliver to Northern and the Republic of Ireland but this can be expensive. We have recommended haulage firms that can deliver and offer a personal service to locations throughout Ireland. We specialise in shipping containers across the globe with golf carts for golf courses or utility carts for resorts. Our experienced teams will consult with you to get the best price for shipping from point of origin to your final destination either CIF or FOB. We provide you with guidance to the relevant agencies to make sure you obtain all the necessary licences and paperwork for your shipment, and that these important documents stay with your shipment until it has been accepted by the consignee. We can arrange the delivery of containers or just one golf cart throughout Europe, Africa and the Middle East. Including island chains such as Maldives, Seychelles and Mediterranean resorts. The vehicles are loaded and checked by us at our offices. Containers are then sealed and the journey commences. Where possible we ship door to door to most locations but there are occasions where the container will need to be collected or unloaded at port. For rates to ship individual golf carts or fleets of carts and utility vehicles please contact the office and ask for Caron. Not all shipping companies will be responsible for the off-loading of the vehicles at the destination. Upon receiving the vehicles you will need to be able to off load the vehicles either with fork lift equipment, loading/off loading bay or ramps. 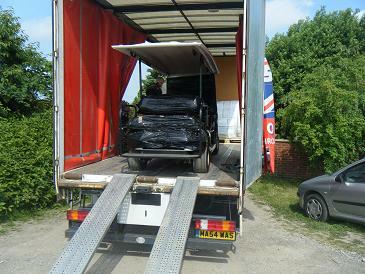 Please be certain prior to arranging delivery that you have the means to safely off load the vehicles you have ordered.